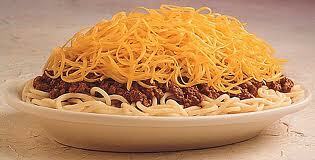 Side note: I am so making Cincinnati chili for a tailgate party later this year. Along the way to a 73-20 win over Eastern Michigan, Ohio State quarterback Terrelle Pryor accomplished something that hasn’t been done very often — he scored three ways, with a rushing touchdown, a passing touchdown (several, actually) and a pass reception for a touchdown. Crappydad and I were talking about this after the game Saturday; we both wondered whether Prior might have accomplished the same thing in the Fiesta Bowl game against Texas a couple years ago, but I didn’t think he had. Fortunately, the Dispatch’s Ken Gordon got help from the university in tracking down the answers. You’ll find a post about all the times a Buckeye has scored three different ways here, but the short answer to the run/pass/catch question is this: Gerald Krall did it in 1948 against Illinois, and Keith Byars did it in 1984 against Iowa. And the most recent instance of an Ohio State player scoring three ways in a game comes with some Crappy Family trivia attached. In the 2004 game against Michigan State in East Lansing, Ted Ginn ran for a score, caught a touchdown pass and returned a punt for a TD in a pretty tight game that Mrs. Crappy and I watched at Buffalo Blues in Shadyside. But as exciting as that was, the capper was seeing Crappydad on TV near the end of the broadcast, standing on the top row in one of the end zones and waving that little Ohio State flag he likes sneaking in to road games. That was a score for us. As a previous inhaler of your Cincinnati chili, I highly recommend it.